Paul Carr and Green Shoots Growing Basketball in Dungloe! 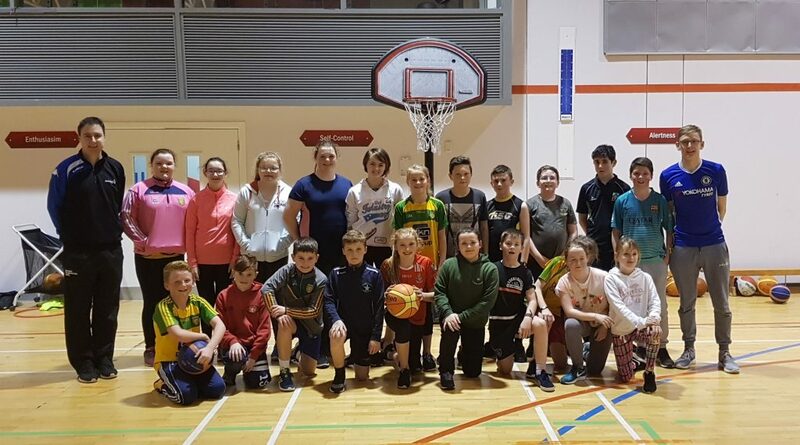 Thanks to local coach Paul Carr every Thursday night over 50 young people come together for 2 hours of basketball in Dungloe. At the minute this basketball has a firm emphasis on fun and getting children active but coach Carr has bigger plans. “Only a couple of years ago we had a good junior club here and we would love to see that back again, the kids love basketball and it would be great to have them in the leagues again”. Last week the kids took part in a Green Shoots session which allows children to learn the game of basketball in a fun environment focusing on physical literacy, basketball skills and the introduction of decision making skills. The kids loved the Green Shoots games with “Wolves and Sheep” a particular favourite in Dungloe. If you have a child who is interested in playing basketball in Dungloe please get in touch with coach Carr at pcarr688@gmail.com or call along on a Thursday night. Under 8s and under 10s play 7pm-8pm and the u14s play from 8pm-9pm. If you are interested in helping out coaching or looking to get involved please get in touch with coach Carr as in order to get a club up and running help is needed. No matter how little time you have to spare all help will be greatly appreciated!